Discussion in 'vBench (Works in Progress)' started by KenBoyle, Sep 24, 2017. 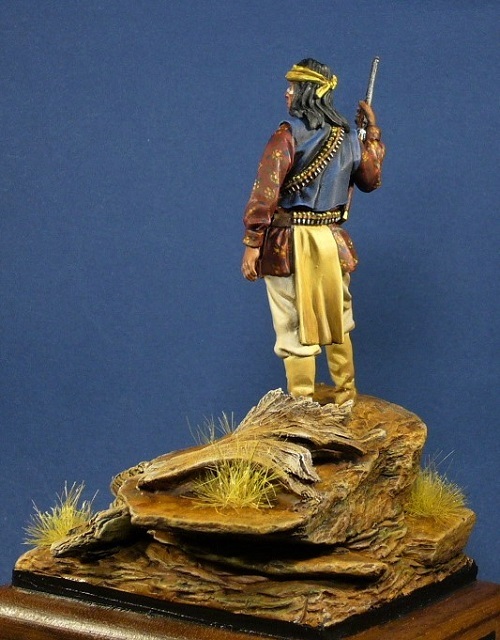 I just finished this oldie but goodie from Andrea, their 54mm Apache Warrior released in 1999. He has been in my gray army ever since and, I thought, deserved some recognition. 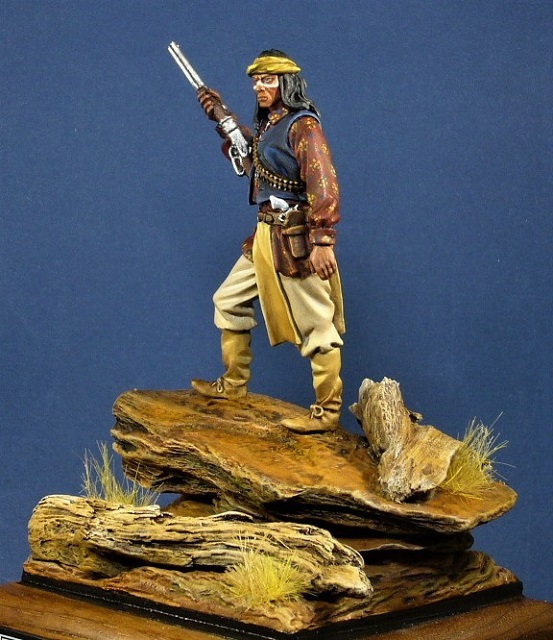 I decided to paint him as a Chiricahua Apache and member of Geronimo's hostile band, circa 1886. The figure was not really modified, but the head, a separate piece, sat a little high on the shoulders and the hair seemd to float above the shoulders. I drilled out the neck to lower the head a little, and bent the edges of the hair down a bit to sit on the shoulders. This was also my first attempt to paint a calico shirt, widely worn at the time. I think the pattern is a little large for the scale but even with my Optivisor, I have some limits. 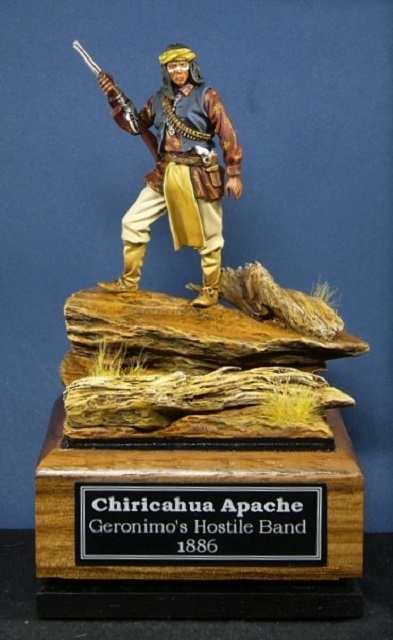 I mention this just so no one asks why the apache I painted is wearing a Hawaiian shirt. 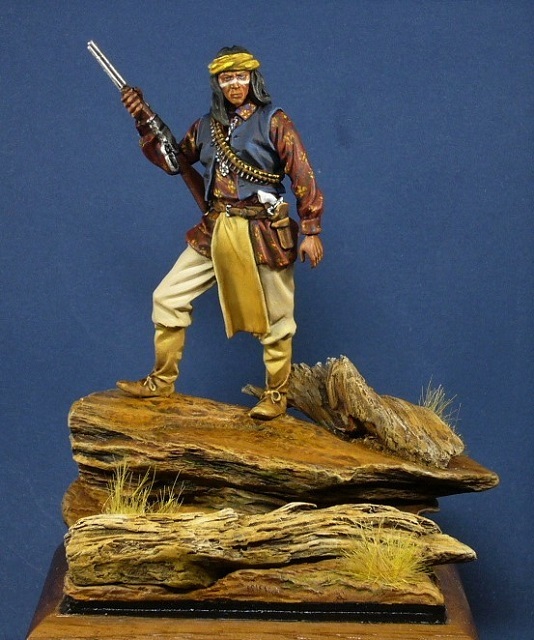 The groundwork was done with, my typical, pieces of slate and Magic Sculpt to tie everything together (as I described in my thread for Orinia's 28mm US Cavalry vignette). I also added two dead tree trunks made from small pieces of driftwood for a little variety. Everything was painted with acrylics. napoleonpeart, John Bowery, stoffy01 and 23 others like this. Beautifully done and tied into the base very well. Apaches are a fascinating and much neglected and maligned subject.That is some serious painting there.I love how you managed to portray an environment that oozes apacheria.Very well done indeed. You have a knack for the subject matter and the groundwork is some thing else. I would be over The moon if this was mine. As Oda has said a much maligned subject. Fantastic painting. Oda and KenBoyle like this. Very nice. Great subject and the base really sets it off well. Very well painted and presented. 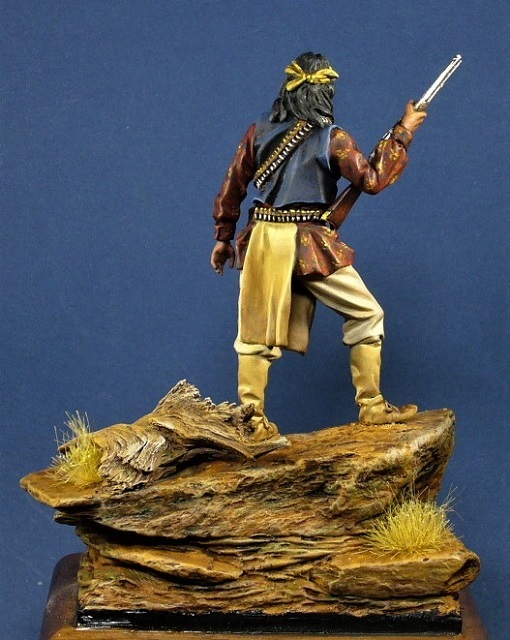 I just finished the Semper Fidelis Apache. 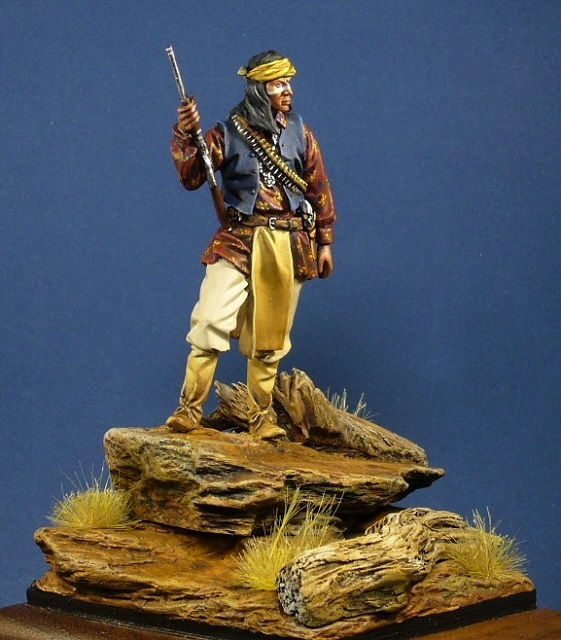 I did not try a calico shirt though; I wanted the cavalry jacket to be the color spot of the figure. The paintwork is great and the groundwork really sets the figure off Ken . I'm wondering though why he is wearing an Hawaiian shirt . Beautiful work as always, Ken! Love the ground work, too. KenBoyle and Oda like this. Lovely painting, and the groundwork takes it to another level. I really like what you've done with this one. Oda and Viking Bob like this. Thanks guys! I appreciate the kind comments. This was a fun figure to do and I love , as you may have guessed, doing groundwork from the American West. Ataboy Ralph! I new I could count on someone to comment on the shirt. You didn't disappoint. superb painting Ken, everything is just working perfectly together ! anyway do not bother : the shirt looks perfect ! Superb painting of the figure and the groundwork is outstanding.